Bhubaneswar: Eradication of Malaria is possible with the concerted efforts of the government, Civil Society Organisations and most importantly the Community, said Dr. Madan Mohan Pradhan, Joint Director (Health Services) of National Vector Borne Diseases Control Programme, Odisha. As the chief guest he was addressing the Workshop “Challenges of Malaria in Odisha” organised by Anwesha Trust with the support of Oil and Natural Gas Corporation Ltd (ONGC) and Bharat Petroleum Corporation Ltd. Dr Pradhan shared that the unique programme of Durgama Anchalare Malaria Nirakarana (DAMaN) being implemented in the highly malaria prone districts of the state has been yielding very good results in containing malaria in the inaccessible areas of the state. 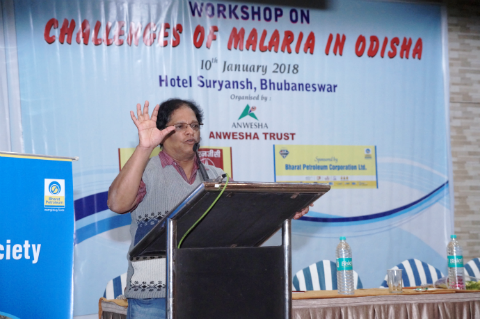 Dr. M. M. Mishra of Bhubanewar Regional Office of Health and Family Welfare Department, Govt of India, educated the participants about various government programmes for malaria eradication and the challenges confronted. Suman Khatry working as the Vector Control consultant with the Regional Office stressed upon breaking the chain of parasites-mosquitoes-malaria victims through different interventions. 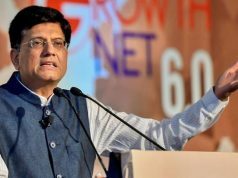 Shaktidhar Sahu, director of My Heart stressed upon proper behavioural change communication (BCC) at the community level to effectively contain the disease. Ms. Swapna Tripary, chairperson of the Trust presided over the session. The workshop was attended by more than 70 participants from different sections like CSOs, media persons and the students. In the second session, Debakanta Sandhibigraha of NVBDCP elaborated on DAMAN program. The objective of this program is to reduce the malaria parasite load in the communities in the inaccessible areas of high malaria endemic blocks by diagnosing both symptomatic and asymptomatic malaria cases through mass screening and ensuring complete treatment of all malaria positive cases. This is done by conducting annually two camps in these areas for screening and treatment of malaria and distribution of long lasting insecticide treated nets. Chandrakanta Mohapatra of CVBDCP stressed upon the role of the community in the eradication of malaria. Saffiquebhai presided over this session.